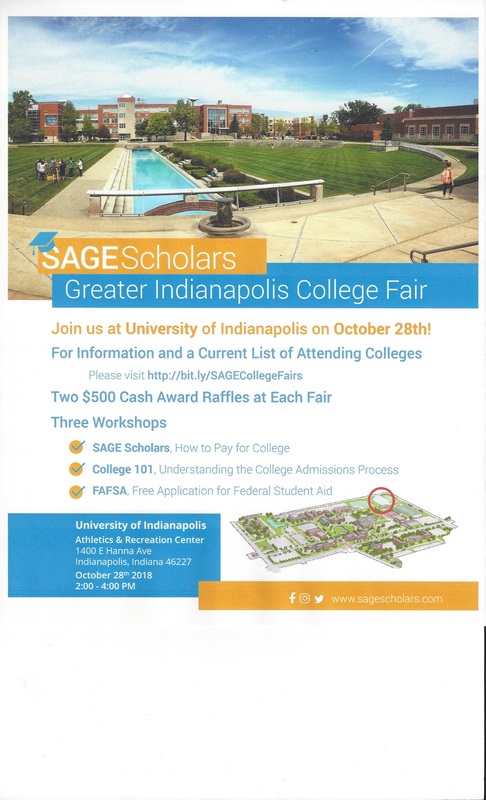 Attached is a flyer about the Sage Scholars Greater Indianapolis College Fair that is taking place on Sunday, October 28th, at the University of Indianapolis from 2 p.m. – 4 p.m. There are over 30 colleges and universities that will be attending this College Fair, and quite a few of them are from close around central Indiana. In addition to the colleges and universities there will be workshops on “College 101” and “FAFSA Completion”. This could be very beneficial to students and their parents as they start thinking about where to go to school, what is available, and how to pay for it. For more information and the exact location, see the attached flyer or go to: http://bit.ly/SAGECollegeFairs. Please feel free to share this information with others, especially families who are starting to think about colleges and universities for their children.